Aluminum Tap Connectors | CMC Parallel & Tee Tap Connectors | Cal Fasteners, Inc.
CMC type GP and type GT aluminum tap connectors are manufactured from a special alloy material that provides exceptional strength and superior electrical conductivity. All configurations and sizes/configurations are dual rated for use with both aluminum and copper conductors. 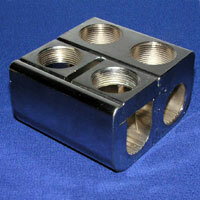 An electro tin plating adds corrosion protection and provides low contact resistance. Type GP and GT mechanical tap connectors are easy to assemble and install—a screwdriver or allen wrench is all that is required (depending on model). Connectors are reusable. UL and CSA rated and RoHS compliant. All CMC connectors are manufactured in North America. If these tap connectors are not right for your needs, we also offer CMC type GPT aluminum tap connectors. Request a quote on aluminum parallel tap connectors and aluminum tee tap connectors, or contact Cal Fasteners to learn more.